이팝나무란 이름은 꽃이 필 때 나무 전체가 하얀꽃으로 뒤덮여 이밥, 즉 쌀밥과 같다고 하여 붙여진 것이라고도 하고, 여름이 시작될 때인 입하에 꽃이 피기 때문에 ‘입하목(立夏木)’이라 부르다가 이팝나무로 부르게 되었다고도 한다. 곳에 따라서는 나무의 꽃이 활짝 피면 풍년이 든다는 이야기도 있다. 진안 평지리 이팝나무의 나이는 약 280살 정도이고, 높이는 13m 내외이며, 가슴높이 둘레는 1.18m에서 2.52m까지 된다. 마령초등학교 운동장 좌우담장 옆에 7그루가 모여 자란다. 이 지역사람들은 이팝나무를 이암나무 또는 뻣나무라고 부르기도 한다. 이팝나무가 모여 자라는 곳은 어린 아이의 시체를 묻었던 곳이라 하여 ‘아기사리’라고 부르며 마을 안에서 보호하고 있었으나 초등학교가 생기면서 학교 안으로 들어가게 되었다. 진안 평지리 이팝나무는 이와 같은 조상들의 보살핌 가운데 살아온 문화적 자료로서 뿐만 아니라, 한반도 서해안 내륙의 이팝나무가 살 수 있는 가장 북쪽지역으로서 식물분포학적 연구가치도 크므로 천연기념물로 지정·보호하고 있다. 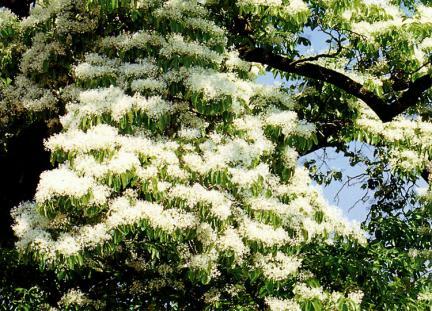 Retusa fringe tree is named “Ipamnamu” in Korean. There are two folk origins about the name of the tree. Some say, the name “Ibap,” literally meaning "rice," stemmed from the fact that its white blossoms resemble cooked rice. 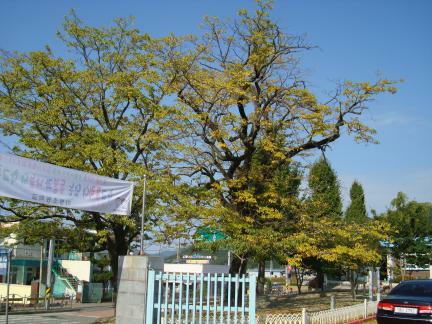 Others say, it once had the name “Iphamok” in Korean (a tree growing in early summer), since this tree blossoms when summer starts. This name was changed to “Ipamnamu”. In some places, there is a saying that, when this tree is in full blossom, there will be a good harvest. 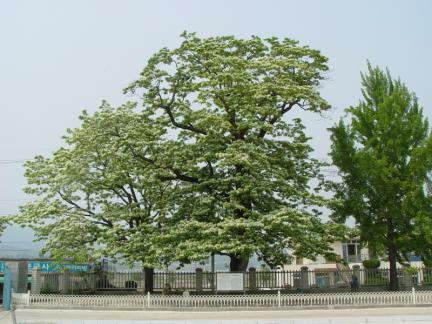 The ages of retusa fringe trees in Pyeongji-ri are not known. They have height of about 13m and girth ranging from 118cm to 2.52m. They stand beside the walls of the playground of Maryeong Elementary School. There are 7 female and male trees. Villagers in this town call them Iamnamu or Ppeonnamu. 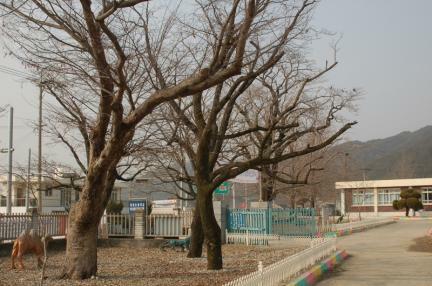 Originally, these trees were protected by the town; since the elementary school was built, the trees had to be included in the school yard. 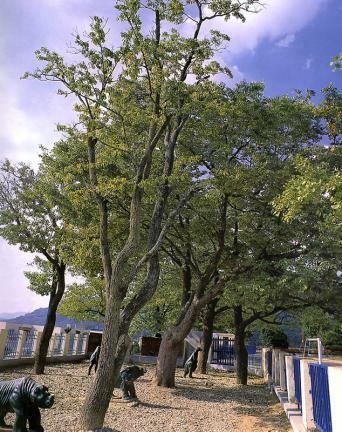 The place where there are retusa fringe trees has been called “Agisari,” meaning a place where children are buried. Now, the forest of retus fringe tree provides children with good shade. During the monsoon season, however, the ground is not well-drained, and the roots of the trees are getting weak. 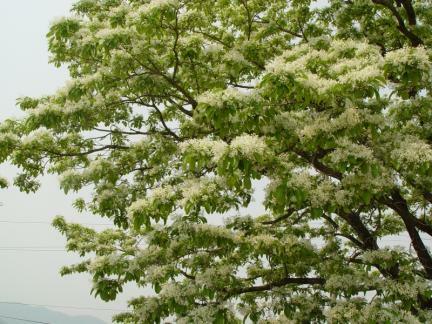 Since the retusa fringe trees in Pyeongji-ri, Jinan have been under our ancestors' care and protection and are also biologically valuable, they are designated and protected as a natural monument.